Kulzy Media Pvt Ltd, a venture floated by one of the promoters of digital media firm Banyan Netfaqs Pvt Ltd, has raised a little over $1 million for its one-year-old venture Kulzy.com, a networking website for the advertising and marketing community, Sandeep Vij, co-founder and director, Kulzy Media, told Techcircle.in. The firm raised the funding from Seedfund and Bedrock Ventures. Seedfund is also an investor in Banyan Netfaqs, better known for its news portal-related to media and advertising industry Afaqs. Kulzy has also raised an additional Rs 2 crore from media and advertising industry professionals including Bobby Pawar, managing director and chief creative officer, Publicis South Asia; MG Parameshwaran, executive director, FCB Ulka; Rahul Kansal, executive president, brand function, Bennett, Coleman & Company; Sonal Dabral, chairman and chief creative officer, DDB Mudra Group; and film-maker Abhinay Deo. Vij said there are thousands of marketing communication agencies and freelance talent hungry for business who are investing almost 40 per cent of their professional time to develop new businesses. "On the other side of the table, anxiety levels about their agency relationships amongst marketers are increasing. This nervousness does push them to be in a continual search mode. Given the size of the global advertising media and marketing community, there resides a huge opportunity," he said. Talking about the investment, Pawar, one of the private investors in Kulzy, said, "I loved the idea of building a community centered around brand ideas, a community that connects the creators, agencies, clients, etc." Kansal of BCCL, another investor, said Kulzy represents a large and untapped opportunity. "While it has started with the advertising industry, the idea Kulzy represents could easily extend to TV and film production, web production, design and a whole range of other marketing services," he said. 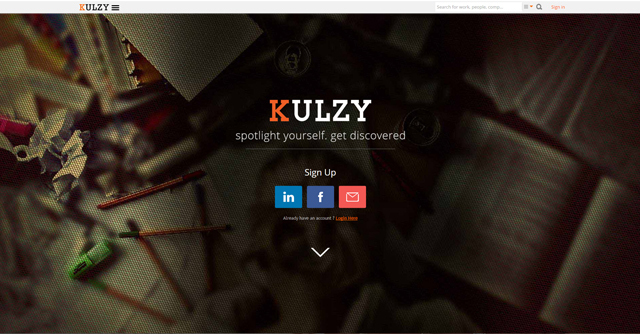 Launched in October 2014, Kulzy claims to have crowdsourced over 54,000 pieces of creative work with almost 30,000 registrations from 6,500 communication agencies across the country. It currently focuses on the Indian advertising and marketing community but soon plans to expand to international markets such as Singapore, Hong Kong and later Malaysia. According to Vij in India the site will be expanding its services to the broadcast industry. "We will be creating a similar experience for the Indian television industry by January 2016. In the television business, it's only the popular names that get recognition from time to time while the talent behind the scene is hardly known. With this, we would like to create a platform where the TV talent gets true recognition. As for entering international markets, we plan to start testing the product by March 2016 and finally launching it April," he said. Kulzy, which is currently free for its users, going forward will be charging members for premium services. Borrowing from the business model of popular crowdsourcing website Behance, Vij said sponsored posts, job post/talent search and premium accounts are some of the revenue channels that he plans to introduce after the property reaches a certain scale after entering international markets and the start of TV network in India.